We have a complete stock of Integral HP Industrial 3 Phase Motors and variable frequency drives from 1-500 HP, 60 hertz, 600/480/240/208 volts. 50 hertz and other voltages under 600 volts can be supplied on request. Motor modifications are done onsite with trained personnel such as installation of 'C' or 'D' Flanges, Thermistors, RTDs, Space Heaters, Vibration Velometers as well as Mill, Chemical, and Washdown Duty to name a few. 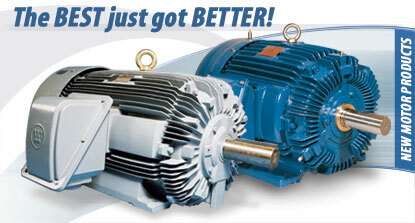 We stock T.E.F.C High Efficiency as well as Explosion Proof Motors at 3600/1800/1200/900 RPM. Stock is available 24 hours a day for industrial clients. If you require more information we would be more than pleased to help you with your request. As part of our dedication to servicing our customer's large custom engineered motor needs, EEC & TWMI conducts engineering, drafting, customer service, field service, manufacturing, testing, and final shipment of several types of large custom-designed and specialty motors. TWMI Induction Motors (available in sizes from 250HP to 30,000HP) deliver operating efficiencies that are among the highest in the world. Available from 2,000HP to 100,000HP, TWMI Synchronous Motors provide superior value with proven reliability, low maintenance, and long life in demanding applications. TWMI's high-torque, variable speed DC machines (with ratings from 250HP to 35,000HP) are ideally suited for the industrial and marine markets. Double-fed wound rotor induction generators are designed for the wind turbine market, and are available from 500 KW to 3.0 MW in various voltages, frequencies, and enclosure types. Also, TWMI will custom design various types of generators to meet specific wind turbine design requirements. The purpose of this area of our web site is to provide you with helpful resources. Downloads to ISO documentation, motor payback efficiency caluclator, links to websites we think you may find useful, as well as our online pricebook registration form. or from the left navigation bar.